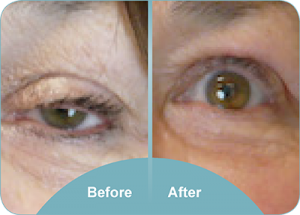 The upper eyelid can hang down and obstruct vision. This is called ptosis. Ptosis is commonly age related and caused by the levator muscle inside the eyesocket “disinserting” from the tarsal plate of the eyelid. Other times this is due to accidents or it may be a congenital condition. Treatment in adults is usually done under local anaesthetic. The muscle is reattached or shortened as required. Most medical insurers cover ptosis surgery. This may require assessment by an optometrist to confirm that vision is partially obstructed and photos from Dr Davis to demonstrate the degree of ptosis. You will be able to check with your insurance company what your policy covers.